They are known for their irregular markings and loud voices, but numbers of African penguins are in sharp decline. That is why a sperm bank for the species has been established in South Africa as part of a new study into their reproductivity. With just 50,000 breeding pairs left from 5 million 20 years ago, African penguins are the only penguin species that are listed as endangered. "We've reached such a low level that it is important to start coming up with these contingency plans," says Dr Katta Ludynia, a research manager with SANCCOB, a leading organization in seabird rehabilitation in southern Africa. "Hopefully we will never get to the point that we have so few birds in the wild that we need to rely on a sperm bank to artificially reproduce penguins. But we could get there, as we are seeing the continuing decline of the species." Agape and Ayoba are the two African penguins that are chosen to play the big role in keeping their species off the extinction list. As the first sperm donors for the new bio bank, both of them were hand-picked as they were the most habituated to aquarium staff, making sample collections easier for future insemination. Their reproductive biology and mating behaviour is now being closely monitored and studied, as a way to secure the species in a long term future through in-vitro fertilization. The study is just one part of a broader effort to sustain the seabirds. This includes rehabilitating sick and injured penguins and combating a lack of food such as sardines and anchovies. But IVF techniques are a growing field in conservation, which has been used on species such as bison and rhino, and so could play a useful role in emergencies. 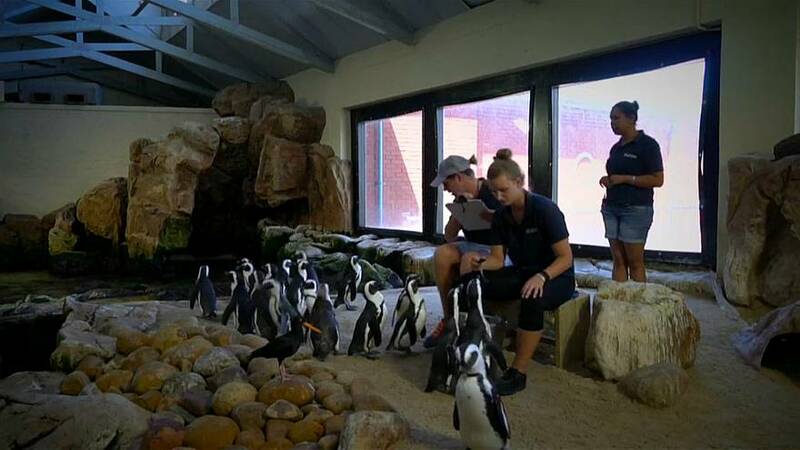 "With this species only found in Africa, people come here specially to see them," said Shanet Rutgers, a penguin manager with Two Oceans Aquarium. "If they aren't here within the next 10 years, there is nothing for them to come to South Africa for and this is what makes them special. So having this sperm collection and in-vitro facility could potentially ensure our future, especially making sure that generations to come can see a penguin species on our coastline."